Thumb-sized and pocketable, the Portable USB 3.0 Card Reader from Xcellon is equipped with one card slot that supports read/write operations to SD, SDHC, and SDXC media, as well as a second slot that supports read/write operations to microSD, microSDHC, and microSDXC media, thus allowing users to engage in tasks such as downloading media from their digital camera or camcorder. While this reader natively supports the UHS-I bus, it is compatible with UHS-II media; however, transfer speeds will be consistent with those of UHS-I. Additionally, both cards slots cannot be used simultaneously. This reader features a USB 3.0 Type-A interface for connecting with your Windows, Mac, Linux, or Android system. To help keep this card reader more secure, a lanyard can be attached through a slot at the top of the device. 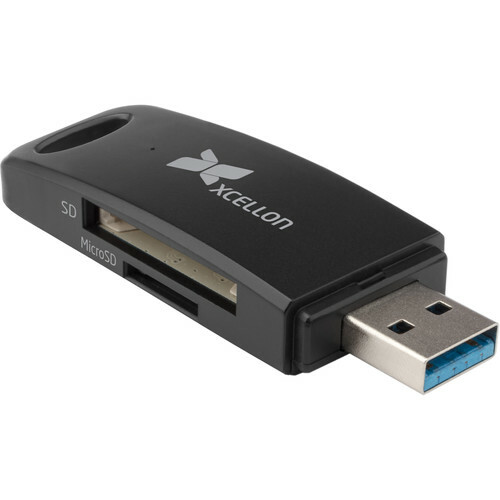 The Xcellon Portable USB 3.0 Card Reader supports SD, SDHC, and SDXC cards, as well as microSD, microSDHC, and microSDXC cards. Transfer files such as photos and videos from your camera or camcorder and save them to your computer so you can upload them to your favorite social networking or streaming sites. While this reader uses the UHS-I bus, it can read and write to UHS-II cards, although the speeds will be consistent with UHS-I. This card reader is the size of a USB thumb drive, making it easy to put it in your pocket and transfer files virtually anywhere you have a computer with a USB 3.0 Type-A interface. Box Dimensions (LxWxH) 5.5 x 3.6 x 1.1"
Portable USB 3.0 Card Reader is rated 4.9 out of 5 by 11. Rated 5 out of 5 by Robert from Transferring pics to my PC or phone is a snap! When I'm traveling, I always like to upload the pics from my camera to the cloud at the end of each day. My old phone used to have a microSD slot, so I would use a microSD card and an SD adapter in the camera, and then put the microSD card directly into the phone to upload the pics. However, late last year I got a new phone that doesn't have a card slot. Rather than needing to carry a bulky card reader and cable, this handy little card reader is easy to travel with, and makes it easy to get the job done on the road. My phone has a USB-C port, so I use the OTG adapter that came with the phone to connect the reader to my phone (see attached photos). Two minor observations (neither of which is a problem): 1) given the asymmetrical design of the reader, the cap needs to be installed the proper way, or it doesn't line up properly, and 2) the microSD slot requires the microSD card to be inserted upside down. This is a great portable reader, and I highly recommend it! Rated 5 out of 5 by Sean from Card reader for my keychain So far so good. ?I have a larger one for my desktop now that is a USB 3.1 with an added CF card slot but you need a cord attached to it and its a little larger. ?This one is compact and will stay on my keychain if I ever need a reader on the go. ?Its basically the size of a thumb drive. ?Be careful not to loose the cover when using it as there is no where to place it on the device when in use. ?When its attached it will not be going anywhere as it has a pretty snug fit. Rated 5 out of 5 by Matlow from Perfection! Thanks to the stellar customer service peeps at B&H Photo, I purchased this card reader to download photos to my Google Chromebook computer instead of stressing out about finding a cable for my ELPH camera, where my photos were. The card reader worked perfectly. What I love about the staff at B&H is that they always try to suggest an option (and it's usually more cost effective). Much appreciated! Rated 4 out of 5 by Chris from Good From what I've seen, it's not only sturdy but it's build strong. The only flaw I see is the loss of the total insertion, in other words you can't put the entire sd card in without a peace of it sticking out, which means it may be more susceptible to damage. Rated 5 out of 5 by Edgar from Excelente. No conoca la marca y me ha sorprendido, la velocidad de descarga es excelente y a pesar de haberlo usado en pocas ovaciones cumple su funcin perfectamente. Rated 5 out of 5 by Max from These are excellent. Bought 2 I had an earlier version of this card reader. Worked so well, I bought a second one. Really great. Very handy. Works perfectly. Rated 5 out of 5 by Shirley from Just what I wanted! Works great, made very well and I would recommend this card reader.